Manipulation of the follicular phase: Uterodomes and pregnancy - is there a correlation? Manipulation of the follicular phase uterine epithelium in women undergoing infertility treatment, has not generally shown differing morphological effects on uterine epithelial characteristics using Scanning Electron Microscopy (SEM) and resultant pregnancy rates have remained suboptimal utilising these manipulations. The present study observed manipulation of the proliferative epithelium, with either 7 or 14 days of sequential oestrogen (E) therapy followed by progesterone (P) and assessed the appearance of pinopods (now called uterodomes) for their usefulness as potential implantation markers in seven women who subsequently became pregnant. Three endometrial biopsies per patient were taken during consecutive cycles: day 19 of a natural cycle - (group 1), days 11/12 of a second cycle after 7 days E then P - (group 2), and days 19/22 of a third cycle after 14 days E then P - (group 3). Embryo transfer (ET) was performed in a subsequent long treatment cycle (as per Group 3). Seven pregnancies resulted in seven viable births including one twins and one miscarriage. Analysis of the individual regimes showed 5 days of P treatment to have a higher correlation for uterodomes in all 3 cycles observed individually. It was also observed that all 7 women demonstrated the appearance of uterodomes in at least one of their cycles. We conclude that manipulation of the follicular phase by shortening the period of E exposure to 7 days, does not compromise uterine epithelial morphology and we add weight to the conclusion that uterodomes indicate a receptive endometrium for implantation. Uterodomes are apical cellular protrusions which occur during the "nidation window" and have been used as uterine markers in conjunction with biopsy and scanning electron microscopy to determine the timing of implantation [1,2,3,4,5,6,7,8]. In some animals true pinocytotic structures have been demonstrated but in other animals including humans, the function of these structures, which somewhat resemble pinopods, is unknown. Hence  has suggested that these structures be referred to as uterodomes. Regardless of the function of uterodomes they are, however, a useful indicator of uterine receptivity in many studies including humans. The correlation between uterodome appearance and the nidation window first proposed by Psychoyos [10; 11], is now generally accepted. However there are still some mammals including humans where the presence and therefore function of uterodomes is not understood. This current work is part of ongoing worldwide interest in the cellular plasma membrane transformation to define the reason for the appearance of these structures [9; 12]. Typically in IVF programs for frozen-thawed embryo transfer (ET) in women with normally functioning ovaries or in women receiving oocyte donation, the endometrium is prepared with exogenous hormones in a manner imitating that of the natural cycle in preparation for ET. Although several protocols for uterine preparation employing incremental doses of E2 and P have been suggested [13,14,15,16,17,18] observation of normal morphological changes using light and electron microscopy has demonstrated that exact hormonal mimicking of the natural cycle is not necessary. This has meant that sequential 'same dose' E2 and P regimes (as compared to incremental dose) can be implemented without the need for variation of dose throughout the cycle [19,20,21,22,23,24,25,26]. More recently, manipulation of the follicular phase of the natural cycle to shorten or extend the length of the cycle beyond its physiological limits has been investigated. In the naturally occurring cycle, short or prolonged follicular phases are uncommon-only 7% are <11 days and 5% are >20 days . The implication of this observation is that 'timed' donor oocyte programs can be initiated with synchronous priming of endometrial receptivity in the recipient. Investigators testing the hypothesis that morphological endometrial integrity reflected functionality ie: implantation and pregnancy, concluded that there was no difference between implantation and pregnancy rates [21; 25; 28]. Moreover, it was shown that the proliferative endometrium is tolerant of some degree of manipulation of the duration of the follicular phase from as short as 5 to as long as 100 days prior to the administration of P [15, 19, 22, 26, 29,30,31]. Other studies suggested that the receptivity of the endometrium, as assessed by pregnancy rates, was best preserved when the follicular phase was kept between 12 and 19 days [23, 25, 32]. Short follicular phases (<11 days) were however, correlated with early pregnancy loss [21, 33, 34]. In the present work, as part of an ongoing clinical study of women in an IVF programme, 7 women were chosen for endometrial analysis because of their resultant successful pregnancies. These women had previously failed to conceive, either after ovarian hyperstimulation or frozen cycle embryo transfer. Part of this study included manipulation and comparison of the secretory uterine epithelium, by using short (7 days) and longer (14 days) sequential doses of exogenous E2 followed by P administration with the morphology of their normal cycle. Endometrial morphology with the aid of SEM was then assessed to determine whether the presence, abundance and developmental stage of uterodomes were useful markers to determine optimal timing of appropriate endometrial maturation which would facilitate successful implantation and pregnancy. The women in the study group were recruited in a single centre, were aged between 28 and 44 years (mean age 32.9 years) and had cryopreserved embryos from previous in vitro fertilization attempts. Of these 7 women who subsequently became pregnant 4 were diagnosed with tubal factor and one each with endometriosis, idiopathic infertility and male factor. All women gave informed consent and the study was assessor-blind. Each patient received oral 50 mcg ethinyloestradiol/day ('Estigyn', Duncan Flockhart) starting on cycle day 1 and continued throughout the cycle. Progesterone (USP) 300 mg/day, as vaginal pessaries, was commenced on day 8 of the 'short follicular phase' study and on day 15 of the 'longer follicular phase' study. Blood serum levels were not followed because it is accepted that there is little or no correlation between endometrial morphology and blood hormone levels [35,36,37]. Ovulation was calculated from LMP in the natural cycle since the women were cycling regularly on a 28 day cycle. Therefore it was not deemed necessary to determine ovulation by LH surge. In the artificial cycles, the ovarian activity was not suppressed by GnRH. Although some women who are on programmed cycles may spontaneously ovulate, the exogenous hormones override any effects presumed from the endogenous hormones [26, 38]. Regime 1: Natural Cycle - no exogenous E2 and P. Biopsies were taken on day 19, (on a 28 day natural cycle, the secretory epithelium would be equivalent to that of 5 days of progesterone preparation). Regime 2: Short Follicular Phase. Starting at the LMP date, continuous E2 was administered. On D8, P was commenced and E2 was continued as before. Biopsies were taken on D 11 or D 12, (equivalent to 4 or 5 days of progesterone preparation). Regime 3: Longer Follicular Phase. As for regime 2 but P commenced on D 15 of the cycle. Biopsies were taken on D 19 or D 22, (equivalent to 5 or 8 days of progesterone preparation).One patient however received her biopsy on day 21. Uterine epithelial biopsies were taken from the anterior fundus, using a Novak curette while the patient was under sedation. The tissue was immediately rinsed in phosphate buffer (PO4) 0.1 M pH 7.4 and placed in 2.5% Glutaraldehyde in 0.1 M PO4 for fixation, rinsed in 0.1 M PO4 pH 7.4 and placed in fresh 0.1 M PO4 pH 7.4. For scanning electron microscopy the fixed tissue was cut into 3 mm pieces and post fixed in 2% Osmium Tetroxide (OsO4) in 0.1 M PO4 pH 7.4 and rinsed in 0.1 M PO4 pH 7.4. Tissue was incubated in freshly prepared 1% thiosemicarbazide, rinsed in distilled water and reincubated in 1% OsO4 (aqueous). After further washing in distilled water the tissue was dehydrated through graded ethanols to 100%, prepared for critical point drying, mounted onto aluminium stubs, sputter coated to 20 nm with platinum and viewed using a Philips Scanning Electron Microscope (SEM) 505 operating at 20 keV. 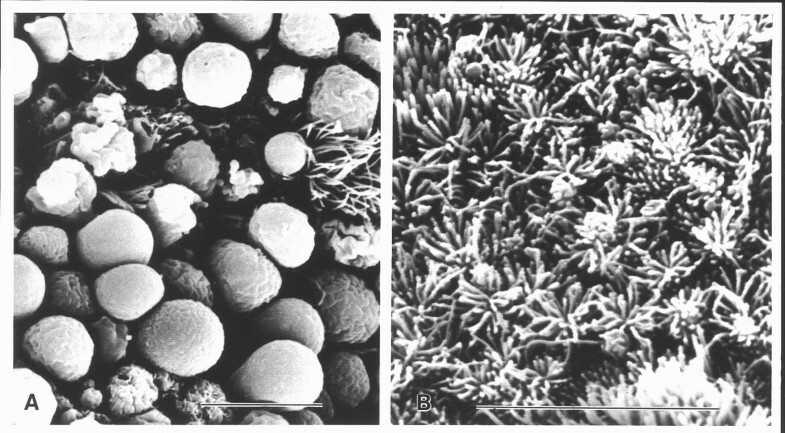 SEM was used to observe and date the endometrial morphology The presence of uterodomes was graded as: (absent, few, moderate or abundant); and their development as: (developing, fully developed or regressing) [7, 8, 39, 40]. The resultant 7 pregnancies consisted of 7 live births (one twins) and one miscarriage. The secretory uterine epithelial morphology of these seven women was observed for uterodomes and correlated to the length of P exposure both individually and as groups per treatment regime. Analysis of the individual regimes showed 5 days of P treatment to have a higher correlation for uterodomes in all 3 cycles observed individually. It was also observed that all 7 women demonstrated the appearance of uterodomes in at least one of their cycles. Three patients biopsied on D5 of presumed P exposure in their natural cycle did not display uterodomes and their epithelium was found to be either (1) suboptimal or (2) retarded (Figure 1a). The suboptimal epithelium displayed variable morphology of flattened, pleiomorphic cells without cell borders, variable microvilli coverage and structure, few cilia groups and erosion or cellular porosity. The retarded epithelium - one biopsy dated as 'early proliferative', displayed ciliogenesis, pronounced cell borders, large polyhedral cells, dense flat microvilli and/or secretion droplets. Both hormonal regimes, either 7 or 14 days of E before P commencement, improved the appearance and amount of epithelia when compared to the natural cycle with uterodomes being observed at D5P (Figure 1b). Where uterodomes were observed 'fully developed' at D5 on short E2 they were found to be 'developing' at D7 on long E2, suggesting their possible maturation at D8 (Figure 1c). 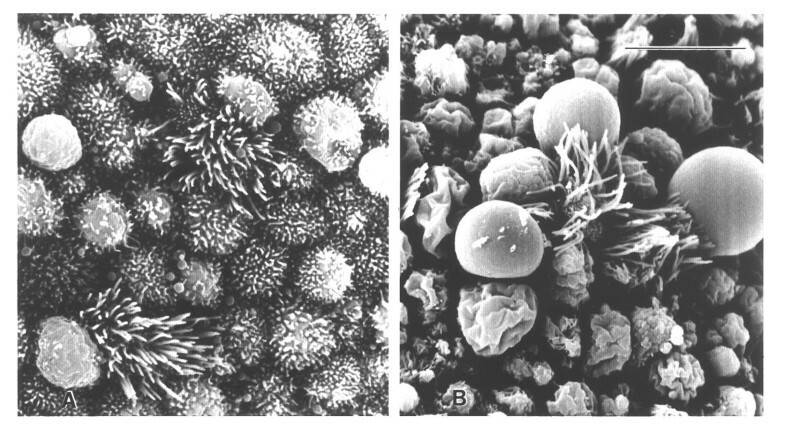 Scanning electron micrographs of 3 biopsies from the same patient (no. 5) demonstrates the variable response of the epithelium to exogenous hormone supplementation. (A) suboptimal epithelial appearance for D5 natural cycle displaying variable morphology of flattened, pleiomorphic cells without cell borders, variable microvilli coverage and structure and few cilia groups. (B) D5 of the short E2 cycle shows an abundance of fully developed uterodomes, (C) D7 of long E2 cycle shows developing uterodomes. Scale bar = 10 μm. Table 1 sets out the individual patient biopsy results for each cycle. It can be seen that patients 2 and 6 benefited from both hormone regimes when compared to their natural cycles, as did patient 5. Patient 4 showed no difference between her natural cycle and treated cycles at D5 and the D4 appearance of developing uterodomes postulates that they would be fully developed by D5. However uterodome abundance for both regimes increased to 'moderate' compared to 'few' in the natural cycle. Where uterodomes were 'fully developed' in the natural cycle D5 (Figure 2a) they were not observed on D8 in patient 1 and were 'developing' in patient 7, and when observed in conjunction with other epithelial characteristics, such as clumping of swollen microvillous tips on protruding cells, demonstrated a retarded epithelium suggestive of pinopod development on D9/10, that is long E2 resulted in a shift in the nidation window (Figure 2b). Patient 3 also demonstrated a retarded epithelium on D8 where uterodomes were not observed. Scanning electron micrographs of the same patient (no. 1) demonstrates a shift in the nidation window with exogenous hormones. (A) An abundance of fully developed uterodomes are shown on D5 of the natural cycle. (B) D8 long E2 shows retarded epithelium suggestive of pinopod appearance 1-2 days later. Note clumping of swollen microvillous tips on protruding cells and secretory droplets. Scale bar = 10 μm. 'Stages of uterodome development (0=absent, 1=developing, 2=developed, 3=regressing) and uterodome abundance (+ = few, ++ = moderate, +++ = abundant, N/A = no epithelium) in consecutive cycles in 7 patients who subsequently became pregnant. Where epithelium was well presented in the natural cycle, neither of the exogenous regimes had further beneficial effect. The two hormonal regimes did not show differential changes in the morphology of the secretory epithelium between equivalent biopsy days but did show a definite trend in an increase in abundance of uterodomes regardless of their maturational stage (Figure 3a;b). Scanning electron micrographs from the same patient (no. 7) at D5 in different cycles demonstrated an increase in abundance of uterodomes utilising exogenous hormones. Scale bar = 10 μm. (A) Epithelium displaying few uterodomes in the natural cycle (B) An increase in abundance of uterodomes after hormone supplementation is observed. In some animals pinopods are known to be pinocytotic and are directly implicated in the implantation process [41,42,43] but in the human and other animals their function is unknown . However the appearance of these structures at, or just prior to the time of implantation suggests they may play a functional role in the human secretory epithelium and implantation [3, 12, 39, 44]. In the normal 28 day menstrual cycle, uterodomes occur at D19-21 (5-7P) [44, 45]. However, in artificial cycles maintained with exogenous hormones, uterodomes have been shown to occur at D21-22 (7-8 P) suggesting that the window of receptivity in artificially induced cycles can be postponed [3, 39]. When sequential sampling was performed during a single natural or artificial cycle (non ovarian stimulated) the timing of uterodome appearance was found to vary by up to 5 days between women . This individual variability could account for observations in the present study where uterodomes were not observed in 3 patients at D5 in the natural cycle. Other discrepancies between the menstrual and replacement cycles have also been shown to occur with delay in morphological maturation being observed in the mid luteal phase [13, 15, 46, 47]. The variability of response between individuals can be monitored with endometrial biopsy and specifically taylored HRT for patients on an IVF program. The women in this study were infertile but not annovulatory and as such it was expected that their epithelium would be responding to their own hormones. Although a delayed epithelial response could be expected because of individual variablility, an improved epithelial response to adjunctive hormone supplementation was also observed. With the advent of biopsy and SEM analysis we are able to directly observe the morphological integrity of the epithelium as compared to the assumed integrity deduced from standard hormone dose delivery, time of ovulation and serum hormone levels. This allows the epithelial response to be 'dated' so that timing of uterodome appearance can be predicted. Since the women acted as their own controls in this study, their natural and artificial cycles were assumed to have the same chronological sequence of endometrial development and as such Days 8 and 15 in the programmed cycles were = P1. In this study patients who displayed a delayed or suboptimal epithelium in the natural cycle did become pregnant with ET utilising the longer cycle (El4, 5P) thus suggesting that hormone supplementation is needed to bring the endometrial epithelium into a state of 'normal' morphology . However this does not imply that pregnancy might not occur with a shorter cylce. It does suggest that the subsequent supplemented cycles may standardise the epithelial response [14, 49]. It has previously been observed that while the morphology of a normal secretory epithelium in a natural cycle  is not affected by an artificial cycle in some patients [24, 39], the integrity of the epithelium is not always preserved in one or other of the subsequent cycles and this suggests an out-of-phase epithelium that is either delayed or advanced [50,51,52,53]. states "on average, pinopodes form earlier in stimulated cycles and later in hormone replacement cycles, compared with natural cycles", and that increasing the dose of hormones gives better results in achieving pregnancies. Providing sufficient E2 is given for endometrial priming , it is the duration of exposure to P, rather than the duration of E2 priming, that is a crucial factor in triggering endometrial receptivity [17, 18, 24, 55]. Our results help to demonstrate that in fact, the presence of uterodomes, and thus the 'nidation window', was delayed when hormone supplementation was administered. The results also demonstrate that utilising a short follicular phase cycle does not appear to compromise uterodome appearance, abundance and shape, and that hormone supplementation may produce a positive effect on the abundance of uterodomes. Women who demonstrated poor or suboptimal epithelium in their natural cycle were observed to show an improvement in epithelial characteristics and appearance of uterodomes with hormone supplementaion cycles. Those with well developed epithelium in their natural cycles did not appear to benefit morphologically from hormone supplementation. If the appearance of uterodomes does herald the window of implantation, then consideration may be given to the usefulness of hormone supplementation in controlling future cycles in these individuals for timing ET. The findings of this study support the following observations that, (1) the consecutive cycles of hormone supplementation we used, while not identical, can delay the appearance of uterodomes, (2) the short E2 treatment did not alter the timed epithelial sequence apparent in an individual's natural cycle, (3) the longer E2 treatment influenced, by retarding, the timing of the epithelial characteristics in comparison to a shorter E2 treatment protocol, (4) in patients showing poor epithelial morphology in natural cycles, exogenous E2 and P supplementation may increase the abundance of uterodomes, which has been correlated to improved pregnancy rates . In summary, since all patients displayed uterodomes in at least one of their cycles, it is likely that uterodome appearance at or just prior to the time of implantation may be an indicator of the functional integrity of the endometrium. While we have not demonstrated pregnancy rates in short proliferative cycles, this study provides further evidence that baseline biopsies and manipulation of the secretory epithelium is a useful tool for timing successful ET.